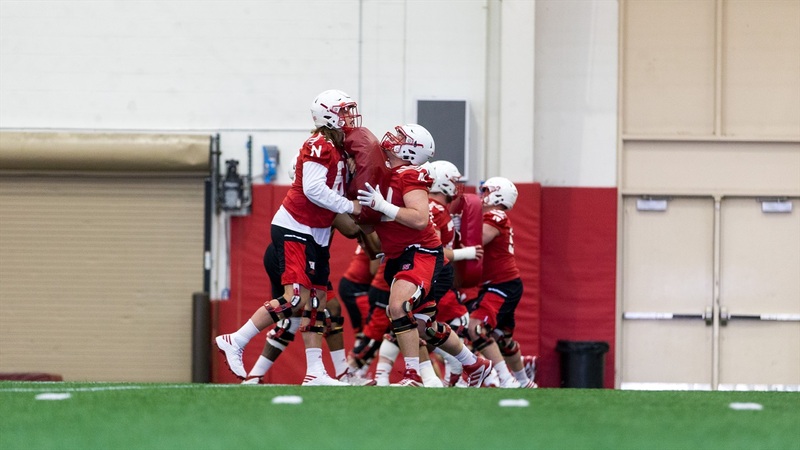 Nebraska returned to the practice field on Thursday and was in full pads for the first time since spring break, which offensive coordinator Danny Langsdorf was happy about. Being in full pads (versus shorts), Langsdorf believes the Husker coaches are able to fully evaluate the players at key positions. One of the areas of evaluation will be the offensive line, where Langsdorf is interested to see both sophomore Michael Decker and redshirt freshman John Raridon at center. The shotgun snaps from both players have been “erratic” at times this spring, so Langsdorf and offensive line coach Mike Cavanaugh will look at both extensively over the next couple of weeks. Decker said he has been leaning heavily on the older players on the offensive line to learn and grow at the center position. Junior Nick Gates’ advice? Relax and move on from mistakes. Nebraska is expected to scrimmage on Saturday, so the opportunity to make those mistakes and learn from them will happen. If there’s one thing both Langsdorf and the players agree on, they’re ready for it. >> Langsdorf likes what he’s seen from the quarterbacks when it comes to checking the ball down. As a result, he said that completion percentages are up. >> Senior David Knevel is feeling much healthier now after suffering a left ankle injury during the 2016 season. He said that experience taught him a lot and he’s better for it as a result. >> I-back Devine Ozigbo is still banged up but Langsdorf did not offer specifics. Ozigbo is not taking many repetitions in practice as a result and also wasn’t able to finish some practices this spring. >> When it comes to the tight ends, there have been ups and downs so far this spring but Langsdorf acknowledges that lack of experience is playing a part in that. Otherwise, he’s been happy with what he’s seen from Matt Snyder and Jack Stoll. As for Tyler Hoppes, he was sick on Thursday. >> Langsdorf liked what he saw from wide receiver Keyshawn Johnson Jr. on Thursday, who went through his first padded practice. After recovering from the side effects of appendicitis, it was impressive for Langsdorf to see him catch on so quickly. “He’s finally getting into it, which is good for him and good for us to see,” Langsdorf said. >> If there’s one thing Langsdorf wants from the offense before the spring game, it’s consistency. That will be a big area of focus over the next couple of weeks. "I think just a big jump in consistency," Langsdorf said. “The ups and downs, whether it's play to play or period to period, whatever we're working on, we just have to have better consistency. I think the work is really good. I think the energy level is great. We've got a lot of good kids that understand, in year three now, what we're trying to do and have a little bit better understanding of that. I love that part of it. The quarterbacks are really battling. We want somebody to get to separate there, and that'll come with some more live work. I like where we're at with this group. I think it is bunch of good kids that like playing and that shows with the energy at practice."